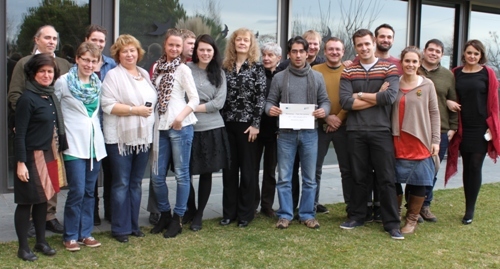 In the context of the project Trans e-facilitator and its online training starting in February, our 15 trainers from Portugal, Latvia and Germany met on January 15th and 16th, 2014, in Barcelona and participated in the train-the-trainer workshop which was hosted by Fundación Esplai. The two days of training provided a deeper insight for the trainers into the curriculum, answers to the last remaining questions about the e-learning platform Moodle and the opportunity to discuss best practices of online trainings. The trainers play a very important role in the pilot phase of the project because they are going to facilitate the learning process of the future e-facilitators. Therefore the trainers were invited to join a two-day workshop in which they were not just trained but also contributed their experience to the pilot scenario and the content of the training modules. Both days provided a stimulating atmosphere in which international networks were build. In the end 15 trainers flew home to start the online trainings in February, highly confident to support their trainees with the trainings. For more information about the project and the trainers please click here.